Feet-Inch-Fraction construction calculator in Spanish For Spanish-speaking contractors, builders, and tradespersons and construction companies with Spanish-speaking employees. All special function key labels, the LCD display and calculated values are in Spanish. Spanish and English User's Guides and Quick Start tutorial video are also included. Provide Spanish-speaking contractors and tradespeople quickly, easily and accurately solve complex construction problems in the office or on the jobsite, reducing costly errors, saving time and preventing expensive rework. It is the perfect tool on the job site or in the office. The Construction Master 5 En Espanol is the first construction math calculator designed specifically for the 30% of the construction work force who are Spanish-speaking. Easy-to-use in the field or office - it meets the need for fast, accurate construction-math solutions. Save time, money and materials. 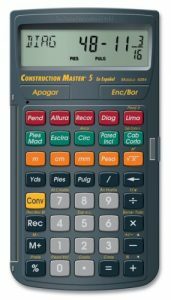 The Construction Master 5 En Espanol is the first Construction-Math calculator designed specifically for Spanish-speaking users. All special function key labels, the LCD display and calculated values are in Spanish. Spanish and English User's Guides are included. With 30% of the construction workforce Spanish-speaking, and two out of every three new construction jobs in 2006 being filled by Hispanic workers, the Construction Master 5 En Espanol will help companies and their employees save time and money. The Construction Master 5 En Espanol helps Spanish-speaking contractors and tradespeople quickly, easily and accurately solve complex construction problems in the office or on the jobsite, reducing costly errors, saving time and preventing expensive rework. It is the perfect tool on the job site or in the office. Standard Calculations: Works as a math calculator with +, -, +/-, ×, ÷, %, π, 1/x, x2, and √.